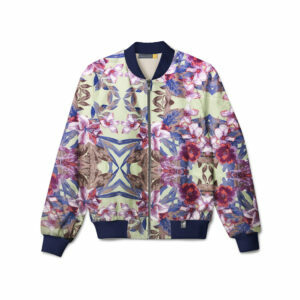 The Miriam Budet “Bloomer” bomber jacket in this amazing blooming flower print makes it a perfect to mix and match with jeans or even a maxi dress. With a focus on the classic silhouette, our “Bloomer” bomber jacket is made with a variety of fabrics and prints amongst which are Italian cotton and neoprene; lined or not depending on the style. It’s the perfect layering statement piece to add to your casual wardrobe. Machine wash warm or cold, tumble-dry low. 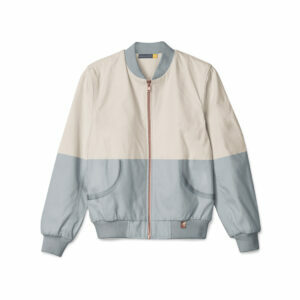 The Miriam Budet “Blue X Rose” bomber jacket features many design elements that keeps it both classic and modern. 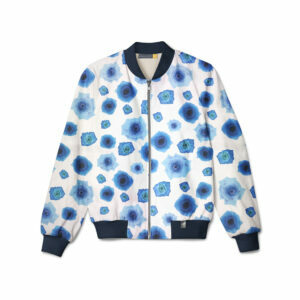 With a focus on the classic silhouette, our Miriam Budet“Blue X Rose” bomber jacket is made with a variety of fabrics and prints amongst which are Italian cotton and neoprene; lined or not depending on the style. It’s the perfect layering statement piece to add to your casual wardrobe. 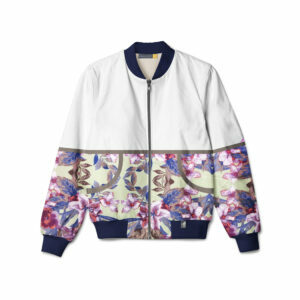 The Miriam Budet “Duo Bloom” bomber jacket features a fresh and modern mix of colores that will definitely make you stand out. With a focus on the classic silhouette, our Miriam Budet “Duo Bloom” bomber jacket is made with a variety of fabrics and prints amongst which are Italian cotton and neoprene; lined or not depending on the style. It’s the perfect layering statement piece to add to your casual wardrobe. The Miriam Budet “Duotone” bomber jacket is a fresh and stylish combination with rose gold details. 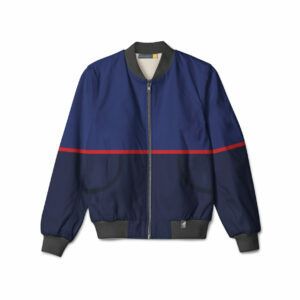 With a focus on the classic silhouette, our Miriam Budet “Duotone” bomber jacket is made with a variety of fabrics and colors amongst which are 4 ply crepe and italian ponte; lined or not depending on the style. It’s the perfect layering statement piece to add to your everyday wear or cocktail wardrobe. Dry cleaning is recommended for all silks. 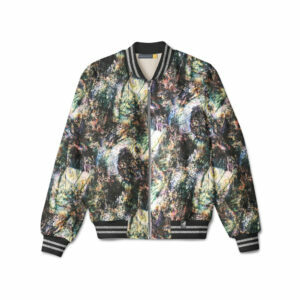 The Miriam Budet “Earth Roots” bomber jacket italian green and blue abstract nature print makes it a perfect transition day to night layer. With a focus on the classic silhouette, our bomber jacket is made with a variety of fabrics and prints amongst which are Italian cotton and neoprene; lined or not depending on the style. It’s the perfect layering statement piece to add to your casual wardrobe. 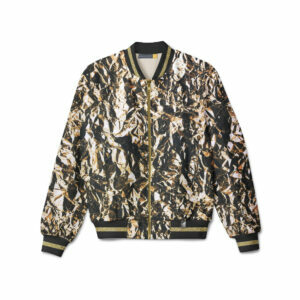 The Miriam Budet “Gold Rush” bomber jacket crinkled foil print that gives the illusion of defined peaks and valleys forming a faux metallic surface makes it a perfect urban but chic look. With a focus on the classic silhouette, our bomber jacket is made with a variety of fabrics and prints amongst which are Italian cotton and neoprene; lined or not depending on the style. It’s the perfect layering statement piece to add to your casual wardrobe. The Miriam Budet “Hamilton” duo tone denim bomber jacket inspired buy the visit of Lin Manuel Miranda and his current visit to our island Puerto Rico with his Play Hamilton is the perfect style and combination to make it a stylish and versatile piece . With a focus on the classic silhouette, our “Hamilton” bomber jacket is made with two tones of denim with a red ponte detail; lined or not depending on the style. It’s the perfect layering statement piece to add to your casual wardrobe. 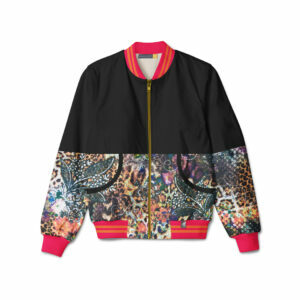 The Miriam Budet “Rainbow Cheetah” bomber jacket features many design elements that keeps it both classic and modern. With a focus on the classic silhouette, our Miriam Budet “Rainbow Cheetah” bomber jacket is made with a variety of fabrics and prints amongst which are Italian cotton and neoprene; lined or not depending on the style. It’s the perfect layering statement piece to add to your casual wardrobe. 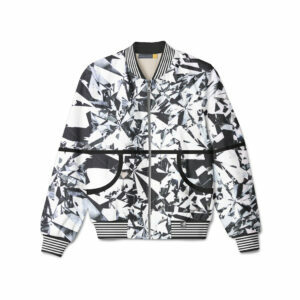 The Miriam Budet “Broken” bomber jacket features many design elements that keeps it both classic and modern. With a focus on the classic silhouette, our Miriam Budet “Broken” bomber jacket is made with a variety of fabrics and prints amongst which are Italian cotton and neoprene; lined or not depending on the style. It’s the perfect layering statement piece to add to your casual wardrobe. 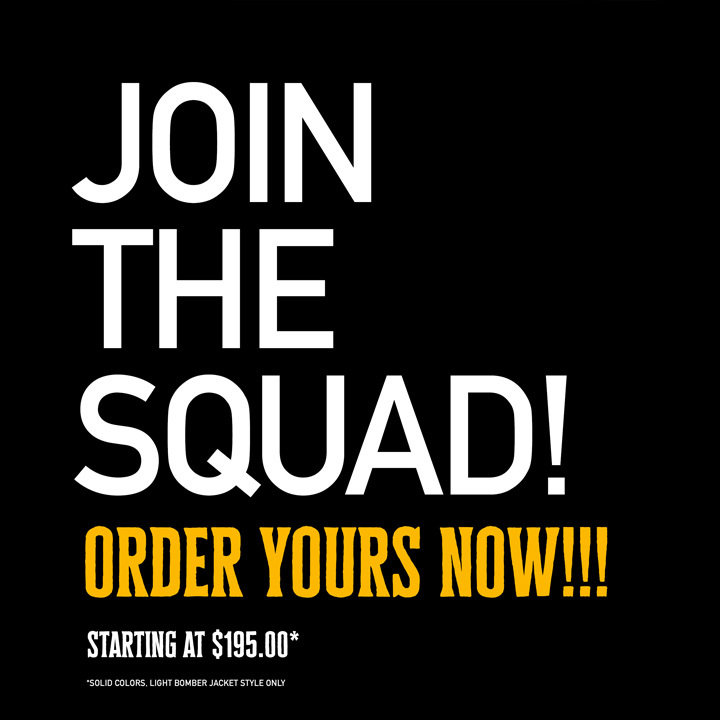 We specialized in designing for those who enjoy fashion, that love to feel comfortable without losing the edge and that don’t mind making a statement but love to make a deference. Get E-mail updates about our latest collections.